Jij kent Ad en Noud? Waar kom jij vandaan dan? Dank je voor je felicitatie's. Die heb jij ok blijkbaar al eens verdient! Ik geloof dat mijn vrouw en ik over een week in Stockhom zitten. Helaas te ver van Ad's adres vandaan. In ieder geval de groeten. Misschien kunnen we nog eens tips uitwisselen via de email. Knowbody any verdict on my engravings? They are horible, but they are my first with the Lindsay so I think that whith a few years practise something good should be getting out of this! Daniel keep up the practice It will come before you expect it to. tech as well hope you can help I do not read your language . I now Ad a few years i did learn a lot of him, i speak and write Dutch because i did live a time in Belgium and speak with Ad Dutch but i'm from Sweden i do live near Ad and indeed its to far to go from Stockholm to me or Ad its 4/5 hours driving, i do follow your posts on an other forum zilvermaan and read your postings (interresting) i do not now Noud but i did see on zivermaan forum that Noud is more than interrested in the lindsay, he has/make also a very interresting Ball vise with a very big base there were some pictures on a other forum he makes these i do think self they do look great, Noud wen you read this i think its a great item to place on this forum. Daniel i think you have the same feeling as i did have using the Lindsay the first days. The only thing i did wrong with buying the Lindsay, is wait to long to buy one and not have the plaesure to use one of these very fine and useful tools. I will try to translate a step by step (tutorial) I made. Could take a while though. Would you have a preference? Elise, I just read your tragedy with skiing! What a spell of bad luck. Good that it's all in the past now, but I can imagine the agony in having a Lindsy in your hand and not being able to work with it. Noud is indeed a special colegue. He make's briljant litle vise's as well. I'm the lucky owner of one of them. I'm gald he joined the zilvermaan forum but I think there is not much interesting for him. Funny to that you know that place as well. I saw Alexandre Sidorof (excuse the misspelling) about 10 year's ago and was amazed at how he worked. I had the chance then to work with his pneumatic airgraver for five minute's. Back then I didn't have the fund's for it but I wanted one! Same as you, now I do have one I think of the year's lost not having one. NOt the way to go though, I'm just looking forward. I do think I will have to lose a hobby or two to find the time to engrave. Thanks for the 2 cents Ron. Today I bought two 20oz co2 cylinders. Was a bit hard to get but a pretty close to home paintball jungle business can provide me with all I need. They switched over to compressed air though! Might be interesting to learn as well. Those air cylinders have about 250bars in them and last longer then the co2 one's. Enviromently vriendly and such. Costs more and is a bit harder to be filled, but should be the way of the future! Still having my fresh second hand co2 cylinders I had to get on a train straight away an was schocked whenn the conductor asked for my ticket. Think he was curious about the strange noise and crept on me to see what I was doing. He loved my work though and came back three time's to see the progress. I just love the independence with this machine! I put this rig togather for about $200.00 The co2 tank is a 6# soda dispenser preasure cylinder. The cart is from a junk store, and the small regulator is from Steve. The 6# tank will last for about 48 hours. Thanks JT for your advise. I do work with a silent compressor at home though. The co2 is only for work out of my workshop. I did think of asking a local bar for ways to get co2 tanks but found a paintball shop that could provide me with the neccecary equipment. I am working on getting a small reducing regulator from a company that makes paintball guns. If this works out, it will allow the use of the compressed air tanks (carbon fiber tanks @3,500 to 4,000psi) used by paintballers to power the guns. This small regulator is made for one of the guns that can use CO2 or compressed air. It can regulate the air pressure from 3,500 psi down to 200-500 psi.(adjustable). JT has a regulator that does the same thing mounted to his tank. It accepts the tanks using the same screw-on method as the 20oz CO2 tanks, so you can use either tanks. I plan to connect the small regulator that Steve provides to this regulator to control the air pressure down to working pressures under 60 psi. If all works out this will provide plenty of air for either the foot controlled system or the Palm Control system in a much smaller and portable package. I don't know the cost of the part yet, but I will post the info when it is together. Wow! now you guys have me feeling bad. I have GRS stuff and think I am in the dark ages. Before I read this I thought I had the world by the tail. I guess I will have to put one of Steves tools on my Christmas list.. If I were to set up a Classic Palm Graver to my workshop air compressor would I need to have some kind of oil filter or is that necessary. The regulator does not handle that as well as the regulation does it? My compressor it a little loud, how often might it be coming on? It's obvious I am a newbee, I have never engraved the first line yet. If I have not had any class or schooling would it be of any value to get a Palm graver and start fooling around on my own, or is that somethiong that will hurt me more later on when I get into the class? Well a classic pc would never hert you at all, but if you are just starting out I think you will be needing quite a few tools. Here is my tutor / thread for beginners so you get a idea of what you need to start up. As far as your compressor I chose to use a 20lb co2 tank with a regulator (welding) adapted to the tank (welding supply store). No noise at all and with the foot control classic (you can always upgrade to a PC) it lasts quite a long time (weeks of engraving (practicing) and is only 20 or so bucks to refill. If you find yourself short I would get a lindsay artisan. you could do great work with it (as seen by chapi for one) and still have a state of the art tool. I am glad to see some engravers expressing their views on GRS and Lindsay. The only artwork I saw was jewelry. 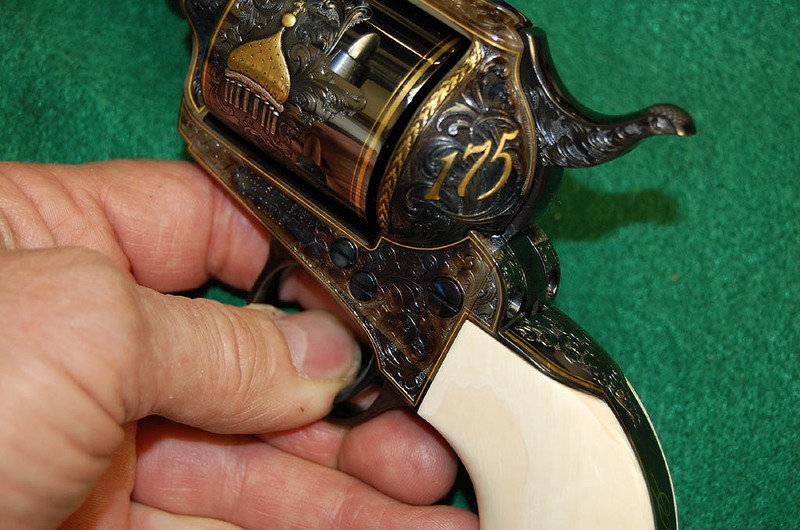 Does anyone have an example of knife or firearm engraving or Bulino. I am a newbie and was going to go with GRS but then found Steve's site and now I believe I want to purchase a Palm Control Classic Airgraver handpiece. It seems to do it all! Feed back would be great! Does anyone have an example of knife or firearm engraving or Bulino. I am a newbie and was going to go with GRS but then found Steve's site and now I believe I want to purchase a Palm Control Classic Airgraver handpiece. It seems to do it all! Hi Mike, That is great about the Colt Engraving Seminar in KC! Look at the picture George Spring just emailed today. 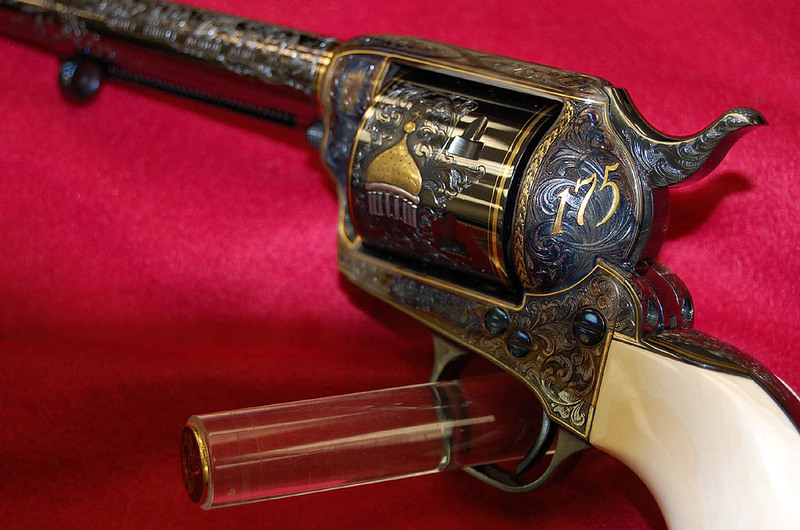 It is the 175th Colt Anniversary gun that George and Steve Kamyk engraved. I just now called George and okay-ed it with him that I post this so soon in this thread. Thanks again George! promote your PalmControl AirGraver if you choose, as a lot of the work was done with it. I have been a goldsmith and diamond setter for 50 years and I'd like to say the brightcuttin, beadwork on these pages are excellent. I always like to see good work. Keep it up.